The Delkin CF 1000X memory card is designed to excel in DSLR cameras and advanced camcorders that require the fastest speeds and the most specialized performance features. 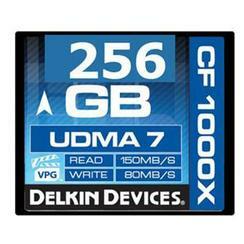 With capabilities to write data at speeds over 80MB/, built in UDMA 7 support, and VPG (Video Performance Guarantee) profiling, the CF 1000X card supports unlimited continuous bursts in some UDMA 7 enabled DSLRs, under and over cranking for professional film-making, and promises not to drop frames or slow your camera's buffer, . . . .